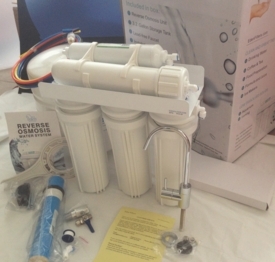 The RO5-50 Reverse Osmosis (RO) water purification system has production capacity of 50 gallons per day. 2nd Stage: Granular Activated Carbon (GAC) Filter Cartridge 2.5x10"(replace every 12 months); takes out most of the chlorine and organic matter. 3rd Stage: 3rd Stage: 10-micron Carbon Block Filter Cartridge 2.5x10"(replace every 12 months); removes residual chlorine and VOC. 4th Stage: 4th Stage: 50 GPD Thin Film Composite RO Membrane (replace every 2 years); removes all contaminants and reduces dissolved solids by up to 95%. 5th Stage: Inline Post Carbon Filter 2x10" (replace every 12 months); provides final polishing of water after the storage tank. The System comes with lead-free faucet with chrome finish, 3.2-gallon pressurized tank , color-coded tubing, and an installation pack. The installation pack includes tank ball valve, feed water valve, drain saddle, inserts and screws in addition to the installation manual. This system has an important component, an auto shut-off valve, which eliminates waste by closing the feed line when the tank is full. The purchase of this product also comes with with one year limited warranty on all parts. 12-MONTH REPLACEMENT KIT IS: RPL4-RO5-50. RO Unit Dimensions: 15 x 8 x 18" H "fits under most sinks"